Modulation of pump speed has been proposed and implemented clinically to improve vascular pulsatility in continuous flow ventricular assist device patient. 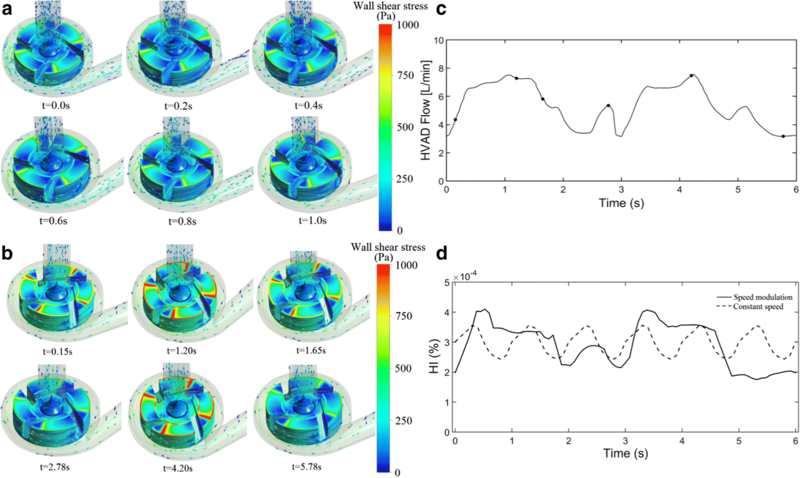 The flow dynamics of the HVAD with a promising asynchronous pump speed modulation and its potential risk for device-induced blood trauma was investigated numerically. The boundary conditions at the pump inlet and outlet were defined using the pressure waveforms adapted from the experimentally recorded ventricular and arterial pressure waveforms in a large animal ischemic heart failure (IHF) model supported by the HVAD operated at constant and modulated pump speeds. Shear stress fields and hemolysis indices were derived from the simulated flow fields. The overall features of the computationally generated flow waveforms at simulated constant and pulse-modulated speed operations matched with those of the experimentally recorded flow waveforms. The simulations showed that the shear stress field and hemolysis index vary throughout the cardiac cycle under the constant speed operation, and also as a function of modulation profile under modulated speed operation. 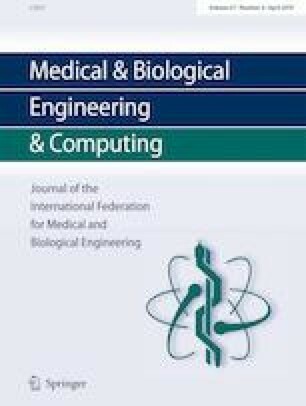 The computational model did not demonstrate any differences in the time average hemolysis index between constant and modulated pump speed operations, thereby predicting pulse-modulated speed operation may help to restore vascular pulsatility without any further increased risk of blood trauma. The streamline inside the HVAD pump and the wall shear stress distribution on the impeller surface at six discrete time instants over one cardiac cycle under constant speed operation (3000 rpm) (a) and under pulse-modulated speed operation (b). c Computationally predicted flow rate waveform under pulse-modulated speed operation. d Computationally predicted time-varying HI generated by the HVAD pump under the two operation modes constant speed (dash line) and pulse-modulated speed (solid line). These figures indicate that the pulse-modulated speed operation may help to restore vascular pulsatility without any further increased risk of blood trauma. The study was funded in part by the National Institutes of Health (Grant Number: R01 HL124170).